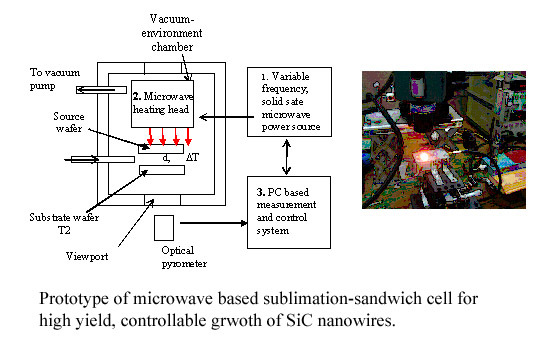 LTT has invented a unique microwave-based sublimation-sandwich method for high yield, controllable growth of SiC nanoswires. It is a simple and effective method to grow SiC nanowires by combineing the advantages of physical vapor transport (PVT) process and catalytic vapor-liquid-solid (VLS) growth mechanism. �	Fast growth rate: 1-2 micrometer/second, at least 10 to 100 time faster than existing methods. �	High process yield and low cost. 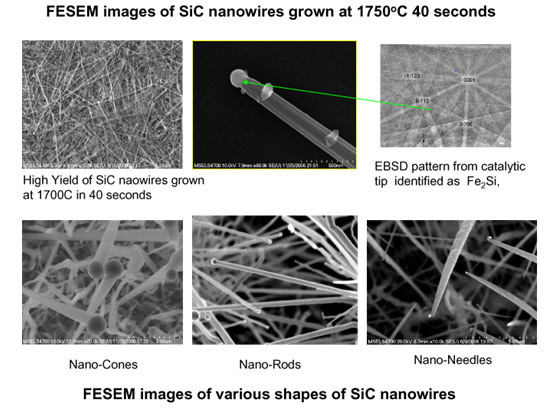 �	Control of morphology of SiC nanowires including shape, size and location. �	Potential control of polytypes and doping concentration of SiC nanowires.